Grade B Label there will be cosmetic defects, Tested and in good health, Picture is not an indication of every drive only an example. This Dell 600 GB hard drive is high-performing, voluminous, and ideal for giving you great performance and data integrity. This internal 3.5-inch hard drive is the ultimate companion when you want to provide high-performance data storage. Power users and do-it-yourselfers relish the dependability and functionality of this Dell 600 GB hard drive. The impressive 10000 RPM spindle speed found on the Dell K054N helps you to backup tons of applications, games, and documents without the wait. 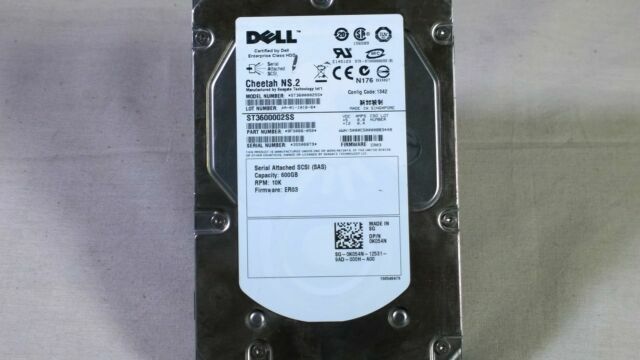 This Dell 600 GB hard drive is very easily installed, which means you are able to effortlessly make the most of it in devices supporting the SAS standard. Save your entire family's mp3 files, software applications, and backups with confidence using the very large storage capacity found on this internal 3.5-inch hard drive. Furthermore, the Dell K054N is very stable, featuring solid construction, which means you are able to enjoy long-lasting flawless uptime without fearing loss of data errors or mechanical breakdowns.